The KwaZulu-Natal South Coast’s glorious coastline boasts kilometres of golden beaches, washed by the warm Indian Ocean and offers a chain of lagoons and rocky outcrops to explore. With its enviable climate and warm surf temperatures, forests, rolling hills and all-year round sunshine, make it one of the prime holiday destinations in Southern Africa, attracting visitors all year round. During the winter months, the South Coast of KwaZulu-Natal is visited by thousands of bottlenose dolphins, which have migrated up the coast from the Cape. This migration occurs at the same time as the annual sardine run, but strangely enough, bottlenose dolphins do not eat a large amount of sardines. The bottlenose is an inshore species that is particularly good at riding and gambolling in the surf, and will spend hours playing in this fashion. The selection of activities is as broad and diverse as the landscape. With 120kms of shoreline, washed by the warm Indian Ocean, water activities dominate with world-class scuba diving reefs, angling, swimming and surfing at the top of the list. There are several nature reserves, packed with birds and small mammals, from the tiny duiker to wildebeest and zebra. The region is also a popular destination for birdwatchers, with 386 recorded species. Sardines mature at about 19cm and reproduce during a prolonged breeding season, from September to February. Most breeding takes place on the Agulhas Bank in the Southern Cape, but some sardines do breed in KwaZulu-Natal. KwaZulu-Natal waters are not particularly rich in plankton, to provide a sufficient food source for the sardines. Sardines, also recognized in South Africa as pilchards, occur in numerous cold water areas of the world. Only a small percentage of the sardine schools go through KwaZulu-Natal waters, where about 700 tons are caught annually, while 4000 tons are caught in the Eastern Cape. All the cans of pilchards in tomato sauce originate from the Cape. Some sardines are processed into fish meal. The majority of South Africa’s sardines occur off the Western and Southern Cape, where about 100 000 tons are caught annually, by purse seine vessels operating from harbours. Cape gannets move up from their huge colonies in the Cape, the closest being at Bird Island, Algoa Bay. Gannets operate in huge flocks, plunging out of the sky, into the sardine shoals. After gorging themselves, the gannets float overnight on the water, in huge “rafts”. Sardines are prey to a wide assortment of game fish such as geelbek, garrick and shad. An adult dusky shark was found with 621 sardines in its stomach. About 20 000 common dolphins pursue the sardine run up the coast, from the Eastern Cape. Cape fur seals and penguins also feed on sardines, but are not often seen in KwaZulu-Natal waters. The Hibiscus Coast has long been a favourite summer holiday destination, with action and attractions for any age group. 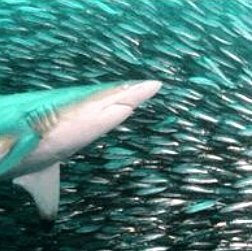 The warm winter months bring even more visitors, when billions of sardines attract thousands of sharks, game fish and birds, and our ocean comes to life. From dolphins frolicking in the waves, to plunge-diving gannets, this is a fascinating and unforgettable experience. This unique and magnificent marine phenomenon has recently caught international attention. During the winter months, the South Coast of KwaZulu-Natal is visited by thousands of bottlenose dolphins, which have migrated up the coast from the Cape. This migration occurs at the same time as the annual sardine run, but strangely enough, bottlenose dolphins do not eat a large amount of sardines. The bottlenose is an inshore species that is particularly good at riding and gamboling in the surf, and will spend hours playing in this fashion. Where else can you find a coastline that offers the excitement of vibrant holiday towns, with huge opportunities for shopping, a banging night life, stylish restaurants and bars, as well as perfect, unspoilt beaches, rivers, lagoons and forests? The selection of activities is as broad and diverse as the landscape. With 120kms of shoreline washed by the warm Indian Ocean, water activities dominate with world-class scuba diving reefs, angling, swimming and surfing at the top of the list. For those who enjoy chasing a small, white ball, the coast boasts a number of world renowned golf courses, with spectacular sea views and memorable 19th holes. There are several nature reserves packed with birds and small mammals, from the tiny duiker to wildebeest and zebra. The region is also a popular destination for birdwatchers, with 386 recorded species including such jewels as the Knysna Loerie, Narina Trogon and the distinctive African Fish Eagle. Traveling inland, the topography changes dramatically, to rolling hills, steep gorges, rushing rivers and indigenous forests. Here you will find scattered Zulu villages where the locals take pleasure in a traditional rural lifestyle, make home-made crafts, using natural materials and wave a welcome to strangers. The region is affluent in natural resources and is an important contributor to the natural economy. Tourism aside, it has excellent soils, sunshine and plenty of water for agricultural production. Farming includes sugar, bananas, pawpaws, coffee, tea and exotic nuts. 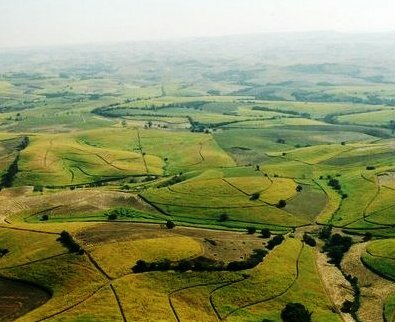 Further inland, you will find maize, legumes, cattle and vast pine, wattle and eucalyptus plantations. The communities of the South Coast are as colourful and diverse as the landscape, and the combinationThe communities of the South Coast of cultures include strong African, Indian and European influences. They are friendly and laid back – some say too laid back – and they know how to enjoy life. Visitors are made to feel welcome and slip easily into the relaxed, carefree, outdoor lifestyle that the South Coast is famous for. Access to the South Coast is easy – and safe. The new N2 freeway which runs north to south along the entire 120kms of coastline, means that you can get out of the rat race and onto the coast in an easy, one-hour’s drive from Durban. Major towns on the South Coast are Amanzimtoti, Scottburgh, Port Shepstone, Margate and Port Edward.